I recently purchased another beauty box subscription – I kind of regret it now with my stash growing a little too fast, but I was in a crap mood when I thought I’d treat myself and buy something to feel better, so I did. Unfortunately, unlike usual retail therapy, I can’t bring these back into the stores to return, so I just have to live with the subscription until it ends. Anyway, Beauteque BB Bag claims to deliver Korean beauty to your door monthly and it includes skincare, makeup, body care, and more. The subscription costs US$24/month; I had a discount code so I bought a 3-month subscription for US$64.80, plus another whopping US$26.85 for total shipping costs to Belgium. That brings each box to US$30.55 for me. This month’s theme is “Beauty Games”. I guess it’s to tie in with the Olympics that went on in August, which has already ended so this is a little late, though it’s understandable as it’s shipped from the US. Honestly, with a quick glance, you could tell that nothing ties in with the theme so honestly they’re better off without a theme. This claims to reduce the severity of blemishes and brighten dark spots. I’m quite happy to get this since I’ve been looking for a new non-acid toner. This is an all-in-one mask with 3 steps – a soothing essence, a brightening eye patch and a hydrating mask. I love sheet masks and this looks amazing; can’t wait to use this! This helps to keep hair out of the face when doing makeup. I’m not making this up but I nearly bought something like this just a couple of days ago from Amazon but it was too expensive so I decided to sit on it first. This came at a perfect timing! This contains 75% prickly pear and claims to balance hydration and oil control, with anti-inflammatory properties. Weirdly, this also came at a good time because I’ve been suffering from rashes lately and hopefully the anti-inflammatory properties in this actually works. This is one of those masks that you spread over the T-zone and then peel off to remove blackheads. I have a love-hate relationship with these because the good ones do help to remove blackheads, but the bad ones are so painful to remove. We’ll see which one this is! There was supposed to be a mystery lip product worth $6.50 but it’s obvious this is neither a lip product, nor have a $6.50 value. It’s a face mask in a macaron-shaped shell, though it only came with one shell. A little disappointed because I would prefer to get a lip product. 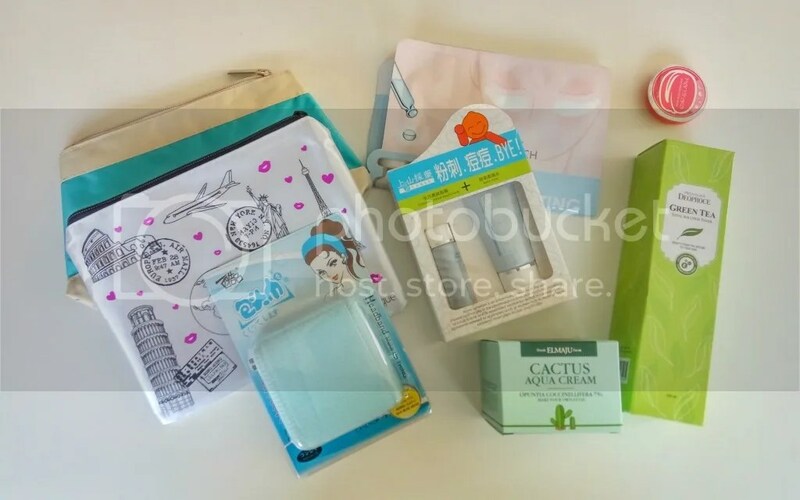 Received 2 pouches – I’m always happy to get more makeup pouches as they get dirty easily and I don’t like washing pouches as they tend to lose colour or shape after a wash. In all, I think it’s not a bad box. The overall value, if using the given retail price, is higher than what I paid for the subscription. However, I also think many of the products are given a higher retail price than they are really worth. None of the names are really popular korean brands, or in fact totally unknown, and some items are not korean. Do I love this subscription? No. I honestly feel disappointed that almost all the brands are extremely obscure. But it’s not too terrible since a few of them turned out to be things that I need right now so I don’t have to go hunt them down! The theme is also super disappointing; nothing ties in with “beauty games” at all. What do you think? Have you ever tried Beauteque BB Bag before?